Carole Robinson was fully prepared for the memories of yesteryear to flood her old-school soul a few weeks ago when she visited the Woodmere Art Museum's John W. Mosley photography exhibit. A child of socialites, Robinson came of age in the '50s — part of Mosley's workaday heyday, from the late '30s to the mid-'60s. Often, she was a guest at the Jack and Jill of America soirees, high-society picnics, and church functions where Mosley made his career capturing images of black people living, loving, and working in a segregated Philadelphia. However, Robinson, now 75, was floored when she spotted herself dancing at a debutante ball. "It just all started coming back to me," Robinson, of West Philadelphia, said Monday morning. The exhibit label identifies the function as a cotillion. But visitors have pointed out that it couldn't have been — in those days, the black community held its cotillions only at what was then the Civic Center. This photograph was snapped in 1959 at the Sheraton — as evidenced by the S’s on the curtains. Not to mention, how could Robinson forget the night her parents, who also are pictured, introduced her to society? It's no wonder that — 57 years later — Robinson was able to identify more than half of the 16 couples with relative ease. "Those were good times," Robinson said before making her way up through the cavernous three-floor show to introduce me to a picture of her 7-year-old self at a Jack and Jill Halloween party. As one of the nation's first black syndicated photographers, Mosley sold his pictures to the Philadelphia Tribune and the Pittsburgh Evening Courier, and from time to time, a few appeared in the Philadelphia Evening Bulletin. Those that were published in newspapers have their subjects, for the most part, identified, especially celebrities. Images of Pearl Bailey, Sammy Davis Jr., Lena Horne, and Bill Cosby, among others, are prominently featured in "A Million Faces." So as soon as the Woodmere collection opened, many visitors — who were toddlers and tweens in those early Mosley days — began naming the details that were once upon a time so well known in black Philadelphia but that are virtually unknown to Woodmere curators. "We are definitely ending with a lot more information than we had when we started," said William Valerio, director and CEO of the Woodmere. Eager to improve the show's accuracy, staff members at the Woodmere collected information from visitors online as well as with the help of note takers who chatted up visitors on Sundays. Although museums typically offer show catalogs at exhibit openings, in this case, curators knew they would learn more from its audience, so the enhanced particulars — names, places, and years — will be published in the exhibit catalog April 1. In some cases, people just wanted to share memories, like Charles Truxon III, whose father was among the first eight bus and trolley drivers in the early 1940s to integrate SEPTA's predecessor, the Philadelphia Transportation Co. Although his father wasn't in Mosley's picture of African Americans demanding in a protest that they be hired as drivers, he remembered what it was like on the streets of Philadelphia then. "My father used to come home every night in his green uniform, and I remember how he felt after a hard day driving those buses with the U.S. Army soldiers riding with him," Truxon, of West Philadelphia, said. When the black bus drivers finally won those jobs, the federal government sent in the U.S. Army to protect them. "I just went down [to Chicken Bone Beach] last year for a reunion." As Greene talked to us, he scanned the photos that featured Joe Louis, the Rev. Dr. Martin Luther King Jr., and in one, bikini-clad West Philadelphia socialite Mary Sullivan, according to Robinson. "I remember there was Aramingo Avenue and New York Avenue. There were lots of Southern restaurants over there. Then the casinos came and closed it all down." Valerio pointed out a photo of seven school-age girls standing in front of a building. A woman visiting with her daughter thought one of the girls looked like her friend, when her daughter piped in and said, "Mom, I think that's you." 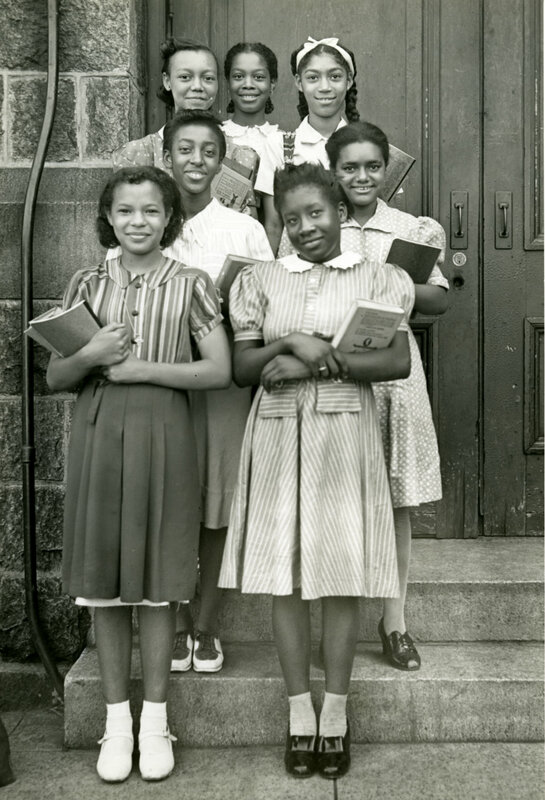 Schoolgirls in front of St. Peter Claver. Clockwise from top middle: Marie Molino, Eloise Smith-Craig, Bertha Masonberg, unknown, Barbara King, unknown, Agnes Precise. Indeed it was. Marie Molino, now 89, was flanked by friends in front of St. Peter Claver, the first Catholic church for African Americans, at 12th and Lombard Streets. Molino, whose father worked at Gimbels during World War II, shared with one of the note-takers that her family lived in a basement apartment at the school during that time. The church is now closed. "That's what makes this exhibit so special," Valerio said. Lillian Clarke was in the middle of reminiscing about her youth one December afternoon when a photo of an impeccably dressed woman in her late 20s — in a fur shrug and elaborate Sunday-go-to-church hat — stopped Clarke in her tracks. "I had no idea my aunt was a part of this exhibit," Clarke, 74, said of the photo that says only, "Easter Sunday." This was Marjorie Tunis (later Marjorie Abrahams), a milliner who worked for the government. A Million Faces: The Photography of John W. Mosley runs through Monday at the Woodmere Art Museum, 9201 Germantown Ave. in Philadelphia. 215-247-0476.